Hear ye, hear ye, the September double issue of Scrapbook News & Review has been published! This month's edition is chock full of amazing tutorials, card and scrapbook layouts, sponsor highlights and more! Be sure to check it out...monthly subscriptions start as low as $4.99! 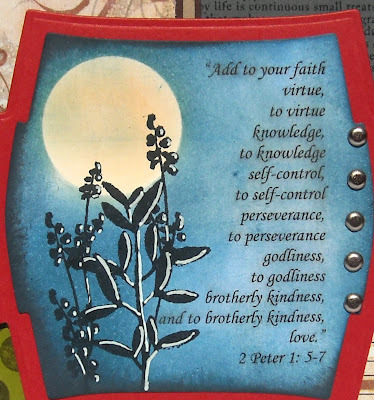 I was thrilled to have a number of cards published this month that featured stamps from Our Daily Bread. A few of the staff members received a stamp set from ODB, which consisted of this amazing eagle head, isn't the detail fantastic, and a few sentiments. 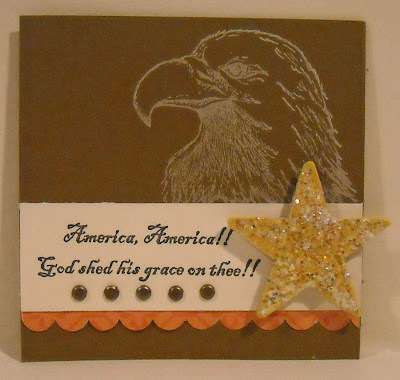 This first card features the eagle's head, stamped in PTI vintage cream ink, on brown cardstock. The star has been dipped in big 'ol chunky glitter...isn't that fun...a few vintage brads, along with a peek of an orange scalloped edge, were attached with the sentiment. Voila! And what do you think? This card just might fit into the Keep it Simple category, right? :-) Enjoy! and easy, yet elegant, card! I hope that the multiple layers on this card won't disqualify it from fitting into the Simple Sunday card category! :-) I love layers on cards and while it might seem time consuming, it takes just minutes when pairing plain cardstock with patterned. Even the panel with the image was cut before adding any ink to paper. That gave me a set amount of space and I needed to find an image that would work. The images on this card are a few that have never seen ink! I picked them up (the birdhouse is one image and the floral pattern on the right in another) at a Ben Franklin sale. Buy two, get one free, how could I pass that up on that offer! 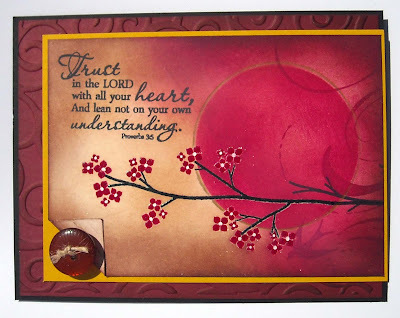 (The sentiment was purchased at the same time) To create the card, I added some serious aging to the main panel with Chai ink from Papertreyink. Then the images were simply stamped in black ink on this same panel. I opted to keep the sentiment on un-aged cardstock, for contrast. And outside of the button and twine (both from PTI), the only "extra" I added was to stamp and cut out a second bird, which was covered with a black glaze pen (see photo below) and attached with dimensional tape. Time to finish this card? About a 1/2 hour but I was experimenting as I went because I stink at visualizing a finished product...It's a problem...just wait until I share my storage cabinet story...yeah...let's just say that there is painting in my future! I recently joined the RAK group on Splitcoast and have been overjoyed at already receiving a number of cards in the mail! There is nothing better than receiving a handmade card, especially when it's "just because" instead of for a birthday or holiday. It's made me realize the importance of being more diligent in sending out the bizillion cards I have to friends and family, just to say hi or to let them know I'm thinking about them. It's nice to think of someone smiling when they receive a card...And I wanted to highlight these ladies beautiful work, please go check out their blogs or galleries when you get a chance! 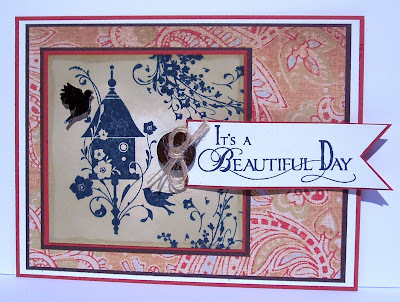 This first beauty is from Stephanie and you can check out her blog here. 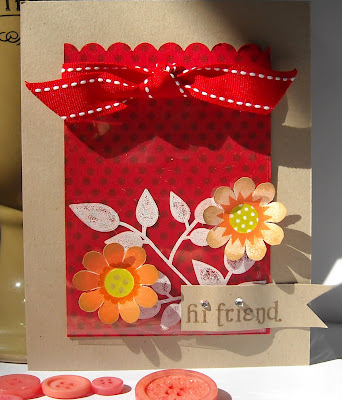 I love the extra little details on this card, like the silver brads and tiny beads in the center of each flower. And it's flowers - my favorite! Great card! This next simply adorable little boy card is from Gloria. Isn't he so cute! And I love that this card is all boy, from the darling image to the jungle-themed paper. Fantastic! 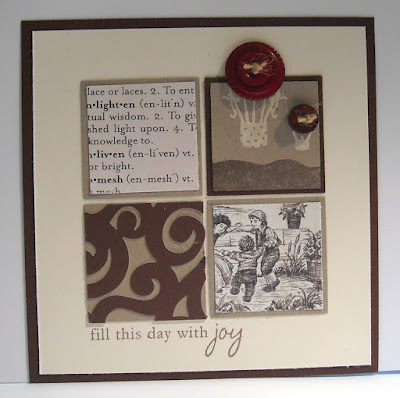 This next creation is from Debra, and she has an amazing gallery over at SCS. This is a simple layout, which I believe she CASE'd from someone on SCS, but it's really stunning. My camera doesn't really capture the depth of the colors but I love the images she used, great card! And she even stamped the envelope! This last one, oh a tree image - my favorite, is from Carrie. You can see her SCS gallery here. 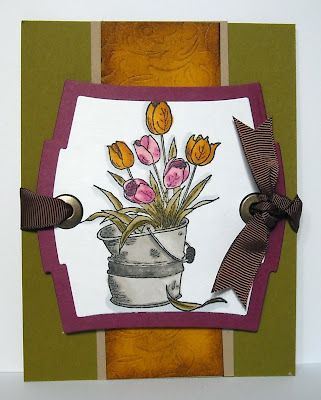 Anyone who knows me knows I'm a fan of all things earth toned and scalloped so Carrie did a great job of capturing both of those elements in this card. Love it! Thank you ladies for your beautiful cards! They all really made my day!! I can't wait to drop some of my own cards in the mail this weekend! Enjoy! When Taylor introduced this set, The Places You'll Go, I just about flipped! Not only do I adore the quotes and images included in the set but I tell my oldest that I love him "all the way to the moon and back" every night at bedtime. So...there was no way I could not get these stamps!! 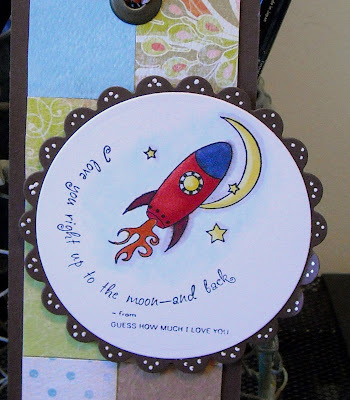 The first item I wanted to create was a bookmark for our son, using the rocket ship and "moon and back" quote, to give to him on his first day of school. Our homeschool curriculum requires a decent amount of reading so this will definitely be put to use! 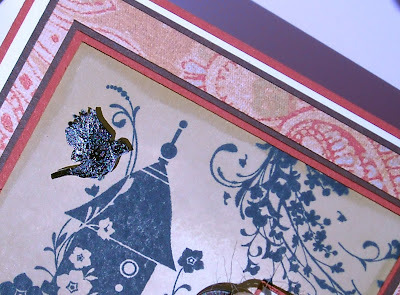 I paired the image with patterned papers that I also purchased from Taylored Expressions. These are beautiful papers and I actually also used them on the card from my last post. The ribbon and big 'ol eyelet are from Stampin' Up! I only wish I had my sewing machine set up because I think stitching would have added a wonderful extra to the bookmark; create a quilt type of look...next time... Here is a photo of the entire bookmark. Our sweet boy was thrilled when I presented him with it and carried it around with him for most of the day. His response, "and I love you all the way to Pluto and back!" You've got to love that! Have a wonderful Wednesday...be back soon with photos of some beautiful RAKs I received last week!! Can't wait to show you the handiwork of some talented ladies! Today's Tip: Make a grid card! I've found a new blog! Or rather a new blogger has found me....and I adore her work! Her name is Jacqueline and you can find her blog, My Scrap Basket, here. Lately, Jacqueline has been posting her beautiful grid cards, which is a card made up of any number of small squares. I had been looking for inspiration for today's post and thought I'd try my hand at a grid card. I've made a few of the mini cards, using the four squares, but this time I went for nine on my 5x5 inch card. This paper, from Taylored Expressions, is so beautiful that it can really stand on it's own. 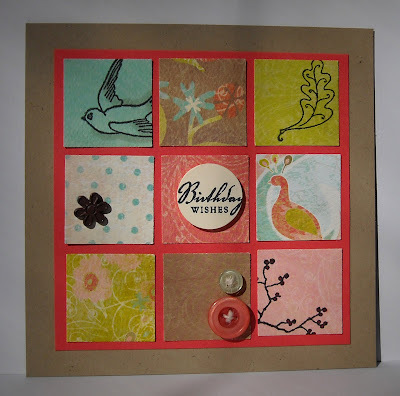 I only added a few stamped images, from Odd Bird Planet, a flower brad, and two buttons (from PTI). Oh, and the sentiment is also from PTI! Total time to finish...about ten minutes...While standing at my desk....minus a chair...in a mostly empty office...because....My furniture has been all moved out of my office and my new huge storage cabinet has been moved in! My craft supplies are all over the kitchen and dining room and I'm just waiting for my hubby to make me a custom countertop before I can post photos of my new space! I can't wait!! I would also like to add that my card is a very belated birthday wish for Kathi Rerek! 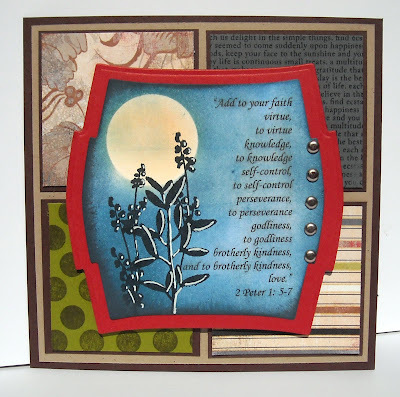 Kathi will be teaching at our upcoming Stamping Around PA event! Hi Kathi, hope your birthday was very happy!! :-) Until then, have a wonderful evening! Wondering if I'm still alive? I am but I'm knee deep in homeschooling materials, dust from a lack of housecleaning, painting projects, and work! All of this has left me with far too little time to create...I even missed my SALT post this week (insert sad face)...However.... I was able to put this little number together a few nights ago but only because I had colored the images a few weeks ago. :-) I participated in a image swap with the gals over at A Faith Perspective and this is one of the many, many (almost 200!) images I received from the swap...isn't it purty? This was a perfect image for trying out my Copics skills and I was happy with the results on my bucket...Still working on my flower coloring! The layout of this card is pretty simple as this is a large image and I couldn't bring myself to add much extra to it...notice I'm even missing a sentiment! Oh, the horror! hee hee Another fun item that I used on this card was an Impressabilities, from Taylored Expressions, on the piece of yellow cardstock. 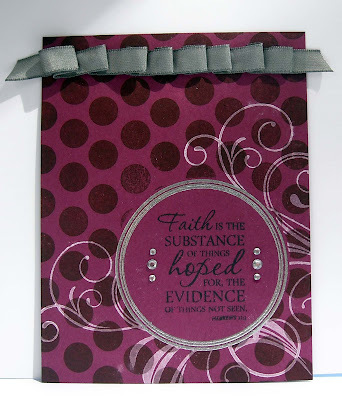 It's a little hard to tell from the picture but the Impressabilities, this one is called Flourish, adds a lovely embossing to cardstock. I added a little aging to the edges of the yellow to highlight the embossed area. I'm not sure who the image is from (my apologizes, if anyone knows leave me a comment so I can give credit to the right company) but the remainder of the supplies is from a company that shall remained unnamed....Oh, ok it's from SU! but I'm not linking to their site! I'll be back in a few days with another post...so I hopefully my three readers can hang in there until then! LOL! Happy Friday! I'm back from Vermont!! My apologizes for not posting from the event...seems my computer wanted nothing to do with the hotel's WiFi connection! After my initial frustration, I realized that maybe two days away from a computer, in a beautiful Inn in Vermont, wasn't such a bad thing after all. First, Vermont is a truly beautiful place! Julie knows a lot about Manchester and the surrounding towns so we took a lovely, winding ride up to the Inn and she was able to tell me a lot about landmarks, great places to stay and eat, etc. It made me want to spend a week instead of two days in that beautiful state! 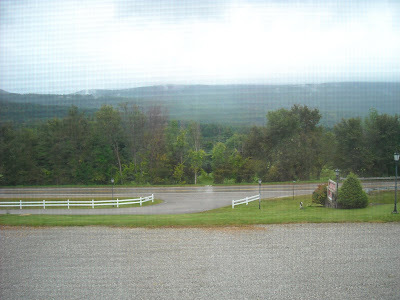 We did have a bit of rain, as evidenced by the photo of the foggy mountains, but the weather ended up clearing and being quite nice. We had a wonderful time at our event, met lots of wonderful people and created fantastic projects! I'll have a more detailed post on the Stamping Around web site tomorrow but for now will share a few tidbits with you here. I wish I had taken more photos! Seems I was too busy or having way too much fun to stop for picture taking this time. I missed getting good photos of the instructors and we had wanted a group photo as well...Anyone want to come along to our events to act as our professional photographer? We pay really well in free stamp sets! :-) Here is our brand new banner in our stamping room! We had a building all to ourselves and it came complete with an enormous stone fire place...so quaint and New England like! A photo of our room...isn't it darling? 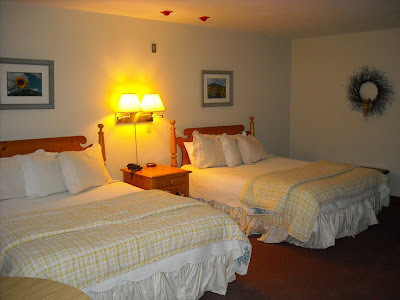 Our room was huge, and you should have seen the bathroom!, it was amazing! I immediately thought that I needed to come back to this Inn with my husband and kids. The grounds were really nice as well as the main lodge. The staff was a bit laid back in their response time, different than my experience at a chain hotel, but you couldn't beat the charm. 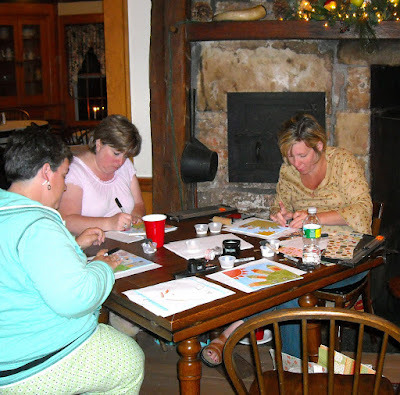 Here are all of our busy stampers working to finish Cindy Lawrence's beautiful project (photos of her project will be on the Stamping Around site tomorrow). Here's our table hard at work on Erika Martin's project, which was a blast to create! 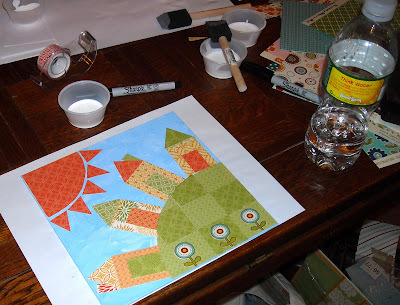 We painted an 8x8 canvas and used scrap paper to make a paper picture. 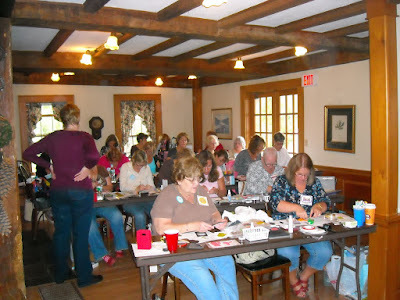 Erika has shared her canvases on her blog before and as soon as we knew we were headed to VT, I knew I wanted Erika to teach a canvas class. So glad she did, everyone really seemed to enjoy the project. My nearly completed canvas...How fun is that! I still need to add a sentiment to the hill but I am in love with this process and want to try this type of project again! And speaking of Erika...here she is! Meeting Erika was definitely a highlight of the event for me. 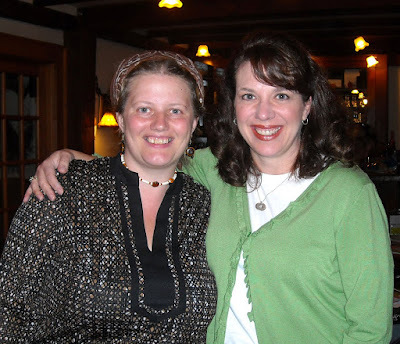 Erika's blog was the very first crafty blog I ever visited! I told her that the first week after I found her blog I completed neglected my family as I spent hours reading her posts and clicking through all of the other designer links on her home page. My husband was ready to stage an intervention! LOL! And just as she seems on her blog, Erika is so down-to-earth and genuine...a real treat to talk to and get to know...I wish we had more time to visit! Maybe at another Stamping Around event...or maybe I'll just show up on her doorstep with my luggage and declare that she needs to show me around Vermont for a week! ;-) I'm off to relax and visit with my hubby! I miss my family so much when I'm gone, even when it's just an overnight. Sigh...being a SAHM can be so tiring but it seems I only need a short break before I'm ready to jump back into the chaos again! I love my little monkeys...it was so good to see them again last night. Be sure to check back at the Stamping Around site tomorrow for great shots of our amazing projects! This is what happens when you leave your three year old alone - for two minutes - with a full can of parmesan cheese while you go outside to tell your husband that lunch is ready. Doesn't he look proud of himself? His response, when I gasped at the pile of cheese on his plate, was "I wike shakey cheese!" Ya think... Yes, we call parmesan cheese shakey cheese...I have no idea why...I think I picked up the phrase from a friend of mine about 15 years ago! Let's just say that my little munchkin had enough cheese on his plate to share with the entire family... 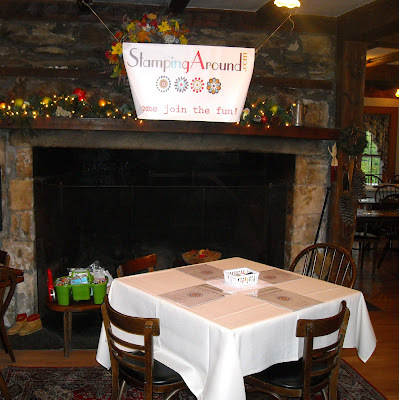 In other news, I'm off to Vermont tomorrow afternoon to attend the Stamping Around Vermont event and I can't wait!! Stay tuned for photos of our class and projects!! Today's Tip: Forget about those layers! Stacy provided the SALT team with our challenge this week and she picked Guidance. Stacy also shared a bit about her testimony on the SALT blog and her reasons behind this week's challenge....check it out! When I first heard the challenge I didn't any immediate thoughts about what to create. Thankfully, I have a nice little pile of Verve scripture verse stamps and the minute I came across this verse from Proverbs 3:5, "Trust in the Lord with all your heart and lean not on your own understanding," I knew it was perfect for this week's challenge! (The creative process was much more painful...more on that later but you can get a clue into how my week went by checking my Twitter updates on the left side of my blog! LOL!) Many years ago, a good friend of mine called me one morning at work and simply said, "here's your verse for today." It was Proverbs 3:5, I wrote it on a piece of paper that morning and stuck it on my desk; it's had special meaning ever since. My favorite portion is "lean not on your own understanding." How often do we decide what we'll do, what is right or wrong, or what we'll believe based simply on what we think or feel. I've heard some say, "I just listen for that still, small voice inside and then I know what to do." That sounds good, maybe even spiritual...but what if that "voice" tells you something that is in direct opposition to what the Bible says? Is it simply up to each of us to decide what is right or wrong, or what to do with our lives based on our emotions or how our heart leads us? If that's the case, then I'm in a heap of trouble because I can feel pretty strongly about something one day and not so strongly the next. The truth is, our hearts and emotions are fickle. The Bible says that "the heart is deceitful above all things and desperately wicked. Who can know it?" (Jeremiah 17:9) Wow - that's pretty strong wording...If this is true, Jeremiah goes on to say that it is the Lord who searches the heart, then can we really trust that our hearts or emotions know - for certain - what is right or where our feet should go? Is there an absolute truth that you can trust and depend upon, no matter what life throws at you? I think there is... 2 Timothy 3:16 states that the Bible is "profitable for doctrine, for reproof, for correction, for instruction in righteousness, that the man of God may be complete, thoroughly equipped for every good work." The Bible is profitable! Not just in how it can change a person's heart but in how it instructs us in the areas of right and wrong, in how to be a good parent, friend, neighbor, or spouse, how to manage your money, how to deal with conflict, depression, heartache, heck reading the Bible can even improve your marital relationship...Is there any better book to lead and guide us in the way to live? Our biggest problems occur when we stop looking to God and His Word for answers and guidance. Then we have a tendancy to lose our footing, to stumble, to become anxious and stressed. I know this happens to me... The advice and council we receive from friends and family can be helpful as we make decisions throughout our lives but we should be careful to also search the Scriptures for solid answers and seek Christ for comfort in uncertain times. And although I doubt we'll ever get a burning bush response from God, if we simply rest in His capable hands and be faithful in regular study of His word, I am confident that He will lead and guide us in the way that we should go. As for my card...Hey, look! It's another Michelle Zindorf inspired creation! I love her work and think I may just work through each of her tutorials one at a time! :-) The branch image is from Papertryink, as is the button and twine, and the verse is from Verve. Enjoy and have a blessed day! This is another card created for a CAS color challenge on SCS...I made this exact card right after CHA but with different cardstock and more color. The SCS challenge was to use only shades of brown and a hint of red. Since I loved this layout, I thought I'd keep it and simply change the cardstock on the four panels. I also layered the panels this time around. I even stayed with the PTI stamp set, Button Bits, because a deep red air balloon is just right with a whole lotta brown! :-) Enjoy!